Original Editors - Billie Rehberg from Bellarmine University's Pathophysiology of Complex Patient Problems project. According to an article written by Fauser et. al in 2008, approximately 100 cases of PM had been published in the literature. According to Jassar and Kumar (2005), approximately 1000 cases have been reported. No associated co-morbidities have been reported. Ibuprofen and other NSAIDs may be beneficial in decreasing pain and inflammation. 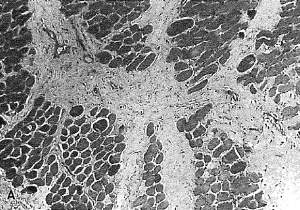 While etiology is unknown, PM may result from injury to the muscle, fascia, or vasculature (resulting in ischemia) of the associated area. Mulier et. al reported a case in which one patient had a mild fever (37.5 degrees C or 100 degrees F). No other cases of systemic symptoms have been reported. Proliferative Myositis is a self-limiting pathology, meaning that the growth of the tumor will eventually stop. While spontaneous resolution of the tumor has been reported, surgical excision is the only treatment and recurrence following excision is rare. No formal reports of the physical therapy treatment of PM have been published. However, it has been theorized that PM is a precursor to heterotopic ossification or myositis ossificans. Thus, aggressive range of motion and strengthening exercises should be avoided to prevent possible aggravation of the condition while the tumor is still enlarging. Following surgical excision, ROM and strengthening exercises and modalities to regain normal muscular function and decrease pain may be beneficial. PM in the bicep of a 65 year-old female. Access this study in Radiology. 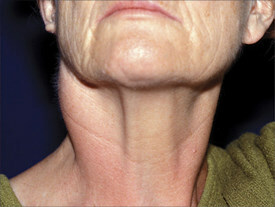 PM in the sternocleidomastoid of a 64 year-old female. Access this study in the Archives of Otolaryngology. PM in the paraspinal muscles of a 14 year-old male. Access this study in Skeletal Radiology. PM in the chest wall of a 48 year-old male. Access this study in The Annals of Thoracic Surgery. ↑ 1.0 1.1 1.2 1.3 1.4 1.5 1.6 1.7 Fauser C, Nahrig J, Niedermeyer H, Arnold W. Proliferative myositis: a rare pseudomalignant tumor of the head and neck. Archives of Otolaryngology - Head & Neck Surgery [serial online]. Apr 2008; 134(4): 437-440. Available from: CINAHL with Full Text. ↑ Meis J, Enzinger F. Proliferative fasciitis and myositis of childhood. The American Journal Of Surgical Pathology [serial online]. Apr 1992; 16(4): 364-372. Available from: MEDLINE. 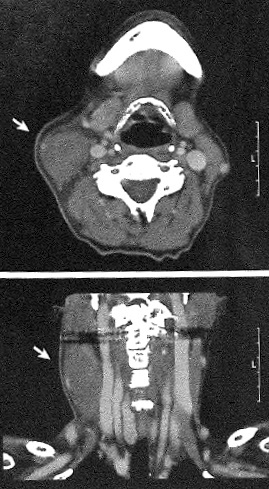 ↑ 4.0 4.1 Dent C, DeBoom G, Hamlin M. Proliferative myositis of the head and neck. Report of a case and review of the literature. Oral Surgery, Oral Medicine, And Oral Pathology [serial online]. Sep 1994; 78(3): 354-358. Available from: MEDLINE. ↑ 5.0 5.1 5.2 5.3 5.4 5.5 Mulier S, Stas M, Delabie J, Lateur L, Gysen M, De Wever I, et al. Proliferative myositis in a child. Skeletal Radiology [serial on the Internet]. Dec 1999; 28(12): 703-709. Available from: MEDLINE. ↑ 6.0 6.1 6.2 Jassar A, Kumar V. Proliferative myositis--a case report. Indian Journal Of Pathology & Microbiology [serial online]. January 2005;48(1):33-35. Available from: MEDLINE, Ipswich, MA. Accessed April 5, 2011. ↑ Sharma S and Banerjee AK. Proliferative Myositis: Report of Two Cases. Indian Journal of Pathology & Microbiology; an Official Organ of Indian Association of Pathologists and Microbiologists [serial online]. 1985;28(3):273-276. ↑ Demir MK, Beser M, and Akinci O. Case 118: Proliferative Myositis. Radiology [serial online]. August 2007 244:613-616. ↑ Kent MS, Flieder DB, Port JL and Altorki NK. Proliferative myositis: a rare pseudosarcoma of the chest wall. Annals of Thoracic Surgery [serial online]. 2002;73:1296-1298.